Bahuchara was given in marriage to a prince who never spent time with her. Instead he would go to the jungle every night on a white horse. One night Bahuchara decided to follow her husband and find out why he never came to her. As she had no horse, she rode a jungle fowl. she discovered that her husband spent the night in the jungle behaving as a woman. "If you are not interested in women why did you marry me?" asked Bahuchara. The prince begged her forgiveness and said his parents had forced him into marriage so that he could father children. Bahuchara declared that she would forgive him if he and other men like him worshipped her as a goddess, dressed as a woman. Today Bahuchara, whose temple is located in Gujarat, is worshipped by impotent men, enuchs, homosexuals and hermaphrodites seeking redemption from a life that has cast them out of mainstream society. Bahuchara is depicted in iconography as sittiing on a male rooster or fowl-- thus symbolising her power over the male gender. please post if your knowledge base is different. now if you notice i did not say she is not an aspect of the devi i am saying that she is not Kateri Mata, Parmeshwari or Dee mata and as how the pujaries might other wise tell us she is not. for you have read her function.Hope this brings a level of questions as to how she arrived in Kali worship. just wondering if some members have dutch and some have devta's can they co-exists in the same household and will there be conflicts??? what does shankerchild mean by dutch? Yes, the icon is indeed that of Bahuchara Mata. The rooster is in fact a reminder of the fact that she is related to Skanda-Karttikeya who has the "kukkuta" or the rooster as his vahana. In Bengal, Karttikeya is worshipped even today for the birth of sons. Eunuchs and hermaphrodites, who are among the disciples of Bahuchara Mata are also associated with childbirth. In fact in olden days Karttikeya Puja in Bengal would be accompanied by a form of dancing by eunuchs and hermaphrodites. But Bahuchara Mata is not exclusive to eunuchs, hermaphrodites or homosexuals. Her myths, like all other myths can be interpreted at the level of "deha-tattva" and is an indication of a "sadhan-paddhati" that worshippers of shakti can fruitfully explore. if i think what you are asking about it would depend on the type of dutch that you have. but according to what i hae learnt on this topic from my friends in Guyana is that these dutch were actually murdered persons that after the Dutch( in this context i mean the nationality of the persons) buried their gold they them murdered the persons helping them and they took their bodies and hung them on the trees to frighten away curious persons from coming to look for their gold now i could be wrong with my explanation but if you look at this through hinduism they would not be called dutch but buuth's which are spirits so i think you need to explain some more. We in trinidad also have them in the cane fields protecting their hidden treasures and pujaries try to tie them into Kali worship by telling persons that this is Muniswaran but this is not so. why would your god frighten you and terrorise you when you come to close to their gold will investigate some more for you but as i said explain some more with this co exsist stuff. my learned friend according to my knowledge base Karttikeya, Subrahmanya,Murgan is one and same just different names and from where i sit kukkuta means rooster not peacock and never have i seen a pic with Karttikeya with his chariot as a rooster however like krishna i have seen him with a peacock and even his banner is that of a peacock.Never did i say that Bahuchara Mata is only worshipped by eunuchs, hermaphrodites or homosexuals my point was that she is worshipped as certain devi's when this should not be so. how would she like when persons refer to her as one when she is another. dear pujarie, thanks for your reply. however, the situation is the dutch committed mass suicide when the british overthrew them. a parent of mine hundreds of years after they died ended up having one, now that parent is passed on and i know that they are around, they never left. my kids have through linage inhereted devtas. do you think there will be any conflict or problems? and can you please explain who sanganee is? and moonie springs? i am now learning and would appreciate your explanations. thanks very much. this parent of yours you say that had passed on did he or she ever manifest and help people or did it give trouble and was always uncontrolled if so this is what i meant by Bhuth. see when some one dies from an unnatural death and the soul had something to complete it wanders around and after some time if the spirit likes you it would have dwell close to that person and probably give them warnings of iminent danger however to say some one had a dutch i think is wrong word phrasing. i mean i was not there and dont know that probably the persons guiding your parent thought of shakti worship as dutch work, from what i know you cant have a dutch for this most times are evil and lead to bodily destruction. No i dont think that your children will have problems once you find out properly what your parent had then you can say for sure but from what you are saying by lineage i think they had shakti but was misinformed but as society on the whole grew so did the worship and now we start to understand a little more and are able to differenciate. Also they have to start their own journey of self realisation for this is a sacrifice in itself they would have to train themselves to be discipline in everything even when the road seem endless but stick with it and i cant stress how much they have to stand for truth, more truth and only truth regardless of what. 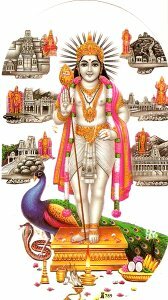 Sangilli Karuppan, he is another form of Karuppusamy, which is a guardian sub-deity originated from Madurai, Tamil Nadu. There are over 100 forms of Karuppusamy, and Sangili Karuppan was one of them, he is more or less a martyr; he used to live in the forest with his henchmen and basically was a “Robin Hood” type figure, he used to war with Madurai Veeran. It was believed that more than thousand poor people lived happily because of Him. Although he knew that he is doing the wrong thing, he was happy to help the poor people. So he did not mind about his ‘job’. After his death he was given the job as 'guarding' God for his good deeds . Sangili Karuppan can be found near Ayyanar shrines near the village entrances. Ayyanar is the figure w/ a big moustache riding a white horse w/ a sword drawn, he is the main guardian w/ other sub-deities accompanying him. Sangili Karuppan is seen as a dark-skinned individual (hence his name "karuppan" meaning "dark-man"), w/ a machete or "cutlass" as you guys call it, raised in the air, and chains tied around him (sangili means chain in tamil), he looks dangerous in appearance and they all do, only for the reason to scare away ghosts, robbers, animals, etc. this was taken from the internet trying to get more on Muniswaran( whom you call moonie springs) but there is a thread in this forum that has excellent lit on him. What i had initally learned from my old temple was wrong so i had to change my way cut and paste the new and correct info. not from only the web but also from what i read in the KALI Purana. Also from what i read on the dutch was that these were poor persons murdered and their souls invoked to protect dutch vessels that were filled with gold and then they were refered to as boundry masters or dutchmen. bear in mind these are not whom you re trying to find out about they have no relations. firstly, my mom when she was a child the dutch was attracted to her. she was taken care by them, they did not hurt us, let me clear this up. they had an agreement and as such they held their end up and mom became "catholic"
after many years of my marriage i found out that my in-laws grandparents has devtas and now it has been passed or somehow got to my kids. the dutch were not boundry masters, i know who there were, they were the overseirs of the sugar estates hundreds years before the british, their names are in the history books. never-the-less, mom has recently passed away of natural cause (she was old) and since they hang around me, i want to know with lord biraiv and ma kali etc from my in-laws linage (which they did wrong things) i want to get an idea on what to expect.....and i am not understanding fully about moonie springs and sanganee, can someone send sanganee to destroy an innocent person? please help me understand . my dear friend i understand your fear from all that you have probably heard, read and investigated this type of worship would be frightening to any one because of the hands on effect it has. However you ask if Sangili can destroy an innocent child the answer is no but remember for all actions there are equal reactions. I do not believe in the sins of the father falling on the children so lets clear that ne time i dont see god punishing you or your children for what what was done prior to your life on this earth. and no my father who stands for the representation of law spiritually and is the lord of righteousness that stands to protect we the innocent be used to do harm to none of his children. But you see this is the impure times in which we walk where leaders of bad character fool people into believing that they can get these devtas to do work by bribing them with sacrifices. these are not their ways what the persons do is capture spirits and use them for their personal gain and mislead people into believing that this could happen. then there are the pujaries who know this and dont explain because they tell us that they can safe guard us and make false tabiche(tailsman) to protect us. knowing that these cant harm us once we properly do our devotion. I never knew of that devi, but I will do some research. I have never heard of the dutch, boy yuh does learn something new everyday. I know of spirits, but never heard of the dutch. what you talking about ? who you thought was Kaani devi dont understand. hey just cool reflecting on the ways of mankind. 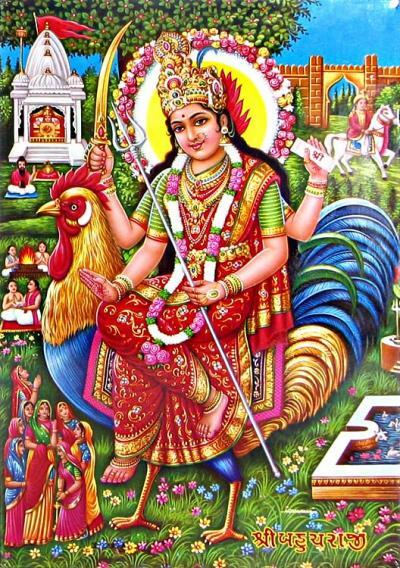 The devi on the rooster was who I thought was Kaani devi Maa. I was off cuz we moved to a different office, ah now catching up on the posts. Sorry. Just adding to the 'dutch' topic, I was once briefed on a type of worship called dutch form. An old pujarie once told me that offering buscuit and butter, even cigars along with rum is 'a dutch form of worship'. Based on what he has said, to my belief when some worshippers say they are offering buscuit and butter, cigars and rum to the three masters (sangali, muneshwaran and kala bhairava), I believe that they are offering those things to a Bhuth instead. I really am convinced here that many are being misguided by those who are ignorant to truth and the right way to do devotion. Seriously, logically, .....is it right to call upon the name of the devta and offer things, that most of us, may not want for ourselves? Are there any evidence to support this offering, or prove that offering these things, is a right way to perform devotion. hey bhiro child that not fear i not grumpy just did not understand which pic you was talking bout. anyways so you thought that was kaani devi, but do you know that there is no such thing as Kaani devi if you are talking about the murti or the offering being done in temple where the pelt the coconut on the stone there is no one called Kaani devi. tell me what you think. yes innocent that is a bit right and also they use to go in the back of the house and do this special type of worship and also use three candles per offering dont know for Khal bhairav and munishwaran but know for what they call the dee and i think they had a name for him i.e PUNCHWAL BABA yes they use to say that this is Sangilli Karupan in the dutch form and then advise persons to do this and also offer meat but what i learnt that this is a form of bhoot worship for certain types of siddhi's. the cigars along with whiskey i once heard was used to bribe Munishwaran for they said that this was is favourite drink and smoke because he is a sought of white man these are just some of the things that i had to unlearn from me old temple. well when most of the kali temples that open in trinidad are based for untruth and the leaders because they have a manifestation think that the old temple needed them so fall out happen they open their own and think that everything the learnt was true go out and advise persons and lead persons to do wrong. sometimes it is ok to unlearn and relearn the true way but that is a bit difficult because of their pride. there is no written documents to prove atleast for my part i have not seen. I have not heard from you in a while. I know my inquistiveness and constant questioning is becoming very annoying. SORRY ABOUT THAT! I have found this extract written by someone in a website. In my perspective, I do respect and understand some of what he is trying to convey, but what I am most confused about is the inclusion of Yamraj and Shani Dev. “sangili karupan madurai veeran and muneeswaran are brothers and they have nine sisters muneswaan is also known as the moon gazer he will c sitting on the curv of the quarter moon he also has a job for all deamons he catches them between his legs and crushes them his other names are munespring baba he form when you will offer him rum and ciggarette sangili karupan rides a black bird chariot when he takes the form as shani dev also in the ramayan they showed hanuman flying with the mountain but when hanuman passed the bramuta triangle shani dev shot him down thats when they had the battle and hanuman chained his foot by the river and when hanuman left shani dev burst the chain and hanged it on his hand thats when he became the black chain master and after he went into the water and lived there for many yearswhen the gods in the water and vishnu and maha lakshmi crowned hin the king of the ocean and he became sangili karupan and after when maha kali mariamman took the form as badra kali and fighted the demons in lanka when sangili karupan came out of the ocean and help her fight her batle after the fight sangili karupan became the gaurd master for the doors of some homes and his name became sanganie baba the door master and now i'll move on to kaal bhairo kaal bhairo is the one who is the potecter of mother kali and mother durga there was a war once against a amn named durgam and kaal bhairo and hanuman stood behind her all through ou the battle after that maa got her name as durga maa after as kal bhairo helped his sister he took the head of durgam and kept it in his hand because durgam got a boon from bramha no matter who killed hin he would kave life in his head so thats why kaal bhairo holds the head in his hand after there was a war in the valley madurai and kaal bhairo defeated them and got his name as madurai veeran the highiest form of kaal bhairo where durga maa and maha kali took the form as kamachi and meenakshi where they ride on the horse with the warrior madurai veeran also here were deamons who were died and haunting areas so thats when kaal bhairo took the form as yam raj the king of death and collected them and the ones who diden't want to go he came with a scary face and his hair messy his vaines poping out of his eyes and he sat on a bull and draged them by there neck and sat and watched them so now people worshin him as pitri dev"
Anybody is free to analyse the literature in which the person chose to support his perceptions of the masters. was and is around just took time off to reflect as theyear is comming to a close and putting my thoughts in place for this comming new year analysing thyself and thinking about what to fix and what to repair and then too the wife have meh busy helping she with the home. “sangili karupan madurai veeran and muneeswaran are brothers and they have nine sisters muneswaan is also known as the moon gazer he will c sitting on the curv of the quarter moon he also has a job for all deamons he catches them between his legs and crushes them his other names are munespring baba he form when you will offer him rum and ciggarette"
i have never with the exception of vetala and bhairava from the Kalika Purana Chapter 50 book 2 about the devtas being brothers i know that Muneeswaran has a primary of nine forms. dont know of the sisters part ( think he trying to tie in the Nav Durga form but then this would mean the nine brothers are the nav graha form) moon gazer is trinidad and guyanese tongue for Candrasekhara because he is the moon but munishwaran is more to lord Shiva not Lord Chandra because most trinidad murtis depict munish prem holding the sun and quater moon this is history worst mistake (moonishprem) the rum and cigs i think you know about. Sangilli karupan is not shani dev this is a graha devta whereas Sangilli is a grama devta they are trying to tie to black devtas together one causes obstacles and the other removes and protects then yamraj is supposed to be sangilli whereas yamraj is also a single devta responsible for taking the soul to be judged. these are three different aspects. the bermuda triangle is an american word so i dont see how sangili could have shot down hanuman, this is just a pre amble for a story. the war between bhairav and sangilli continues where being the robin hood in his era as he was wrongly convicted for murder Sangilli Karupan prayed to the mother as he was chained by hand and feet in a cell and asked her to shower him with her blessing as he was wrongly convicted and with that he broke free however the bangles and chains on his hand and feet did not come off and these were the items of destruction that he used to fight his way out against the guards this is why he has the chains and through tapasya hid in the ocean only when according to the ramayan that laxhman was going to shoot the sea so raam could cross to go to lanka did he emerge stopping him from doing so and as a result became the protector of Varun also.being a kshtraphal he became a guard of the doorways to ward off evil. dont know about him helping the devi or how Sri Vishnu and Maha Lakshmi crowned him probably folklore. the hand that Khal Bhairav holds in his hand has nothing to do with Durga and her war think if they are her protectors why were they behind her and not infront she did not need protection she could have and easily she did handled Durgam the head that Bhairav holds is the head of Brahama. the story goes that brahma overcome with lust for his daughter Sandhya brahma grew a fifth head so that he could look upon her from all directions. Sandhya knowing the lust of her father ran and turned into various animals. Brahma overcome with lust took on the male form to whatever animal she turned into as a result of her flight she passed close to Lord Shiva who saw the folly grew enraged that brahma the father of world creation could become so lustful towards his own child turned into Khal Bhairav and took off the fifth head of Brahma returning him to his senses but for commiting brahminicide (Brahman-killer) the head fused itself to bhairav's hand so heated was the killing that bhairav fell upon the feet of the mother who was the only one that could have resolve such. and as a result of helping him Bhairav stayed with the mother as a protector to her and to protect dharma. as to the war in Madurai dont know and whom did he defeat and Madurai Veeran is not no highest form of Khal Bhairav different names to us but others will dispute that both are two entirely different persons and have no link what so ever. Kamakshi and Meenakshi are both form of Durga Maa who is absolute from her came the rest. i think the last part he is trying to tie Lord Shiva in the form as Bhooteshwar the lord of bhoots who roams about dreadful cemeteries, attended by ghosts and spirits, like a mad man with dishevelled hair and dark complexion. the person has few correct and goes way of he is looking for the root and is trying to formulate decades of history into one paragraph by simplying perceptions of closeness and thinking that because they are similar in colour they are one and same. well atleast these are my views and well i could be wrong. trying to put the tree into place for you be a little patient with me dont want to give you wrong advice. pujarie i learnt that the masters were brothers and Maa Kali their sister i heard them refer to them selves many times as their sister and brothers can you explain. my pujarie taught us that shani was dee baba just in another form and also he is the person in charge of death yamraj. this very confusing. he also said the head khal bhiro holds is a demon head. and moongazer is mooneshprem is he wrong or are you wrong. Yes that is the devi I am referring too, I also know her as Kaanyadaan Maa, a devi of marriage. I asked for her pic in the puja store and that is what they gave me. I am now know. Thanks for the enlightment. Doesnt matter I am pro gay so I am happy to have her image in my home. Your knowledge of this area is impressive and has in many accounts confirmed suspicions that I have had for some time. I am grateful that there is someone who is willing to break ranks with “conventional” acceptance of Kali work and peruse the truth of the matter. On this note I need to ask some questions pertaining to Munispreng. my dear learned friend bhiro child i know it is with accordance with the head pujarie that you refer to Kanyakumari as Kaanyadaan maa but that is not her name her real name is Kanyakumari not as how we had learned or even self kaani devi there is no one by that name. but i guess that is their base knowledge. in hindu traditional the bride does a Kanyadhan pooja so that the bride groom will come for her safely and on time and so forth. this is has no relevance in shakti worship. however long ago when two persons were having problems with marriage devotion was given to poojay her by the head pujarie father with means of keeping people in the temple. and now we have a astan for her. just like in guyana they have an astan for kabir panth a fakir and the call him naagura when there is no relevance of him in shakti worship. then they go about saying to remove anything that belong to allah in a shakti temple but yet the have a muslim saint ( no disrespect to my muslim brothers and sisters) in the temple. this is what i call a double edge sword. these are just certain customs and i stress customs that have been handed down and some how have been transformed into rituals but when you ask why who or how the answers are never justified and makes no sense. they are unwilling to advance and bring progress to the temples because what they have learnt from their father is correct and that is that. they do not want to consider that probably what they have learnt was wrong because then this would mean that shakti worship never belong to them and their dada and papa and uncle and so forth. according to the trinidad and guyanese word Madrasee. Even Madrass has moved forward and we lag behind you dont have to be black to worship Kali. tell them pujarie five o say so. when i posted the text the intention was to edify as i have did not ridicule gays are human also but rather how can the mother help if you address her wrong and poojay her image that was meant for some one else. when you go to the pooja stores they also believe that they know everything but you know the book i used the pic of Anasuya was from a store in trinidad itself and when i showed the girls there of the pics of certain devis they still sell it as how they like but i realise that no matter they just want to make a sale. so one has to edify oneself so these money hungry business places dont fool us do as i did purchase what you want not what they want to sell you.